Colorants in dye-based ink are fully dissolved in water and in pigment-based are insoluble particles suspended in water. A crude analogy is that dye inks resemble salt solution, and pigment inks resemble sandy water. Here are a few pros and cons of dye-based and pigment-based printing inks. This will help you decide which printing ink best suits your printing needs. A dye-based ink has been around longer than pigment-based inks. Because of its age, dye-based ink is more affordable. Dyes have a wider color range and accuracy of color, and are the standard ink type used in most inkjet printers. Printers that utilize dye-based inks will produce prints more vibrantly, pictures tend to look more realistic then pigment-based inks. Pigment-based inks are pigments of color that are ground down very finely and then suspended inside a liquid in order to create ink. Pigment-based inks will most likely last longer. The colors are stored inside the pigments, acting like a barrier to external forces like evaporation or oxidation. The preservation of color is the main advantage. It is a common misconception that pigment inks are more prone to clogging. A pigment particle is 200-300 times smaller than a printhead opening and it is very unlikely that hundreds of particles group together to clog a printhead (more details). However, if a printhead is clogged, dye ink is much easier to unclog because it dissolves in warm water. 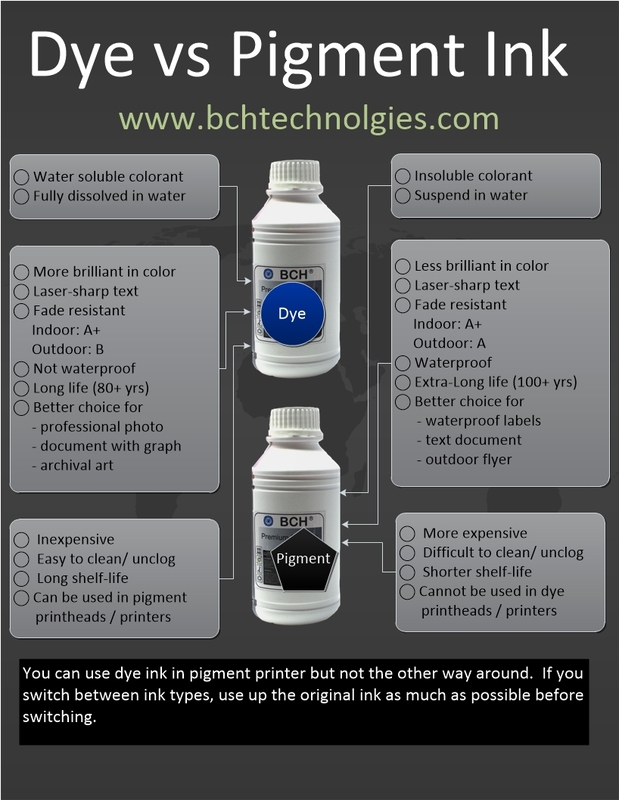 Pigment ink will require special solutions (click here to see more). Dye inks make better photos is because of light reflection (details here)l The pigment print-outs appear differently under different lighting conditions. For example, a print-out may appear black under dim lights but dark green under brighter lights. Why dye ink makes better pictures than pigment ink? Solved: Black/Color Print Head Clogged, Not Printing.